Andrew Murray fell in love with the emerging Rhône varieties, Syrah and Viognier, in the late 1980’s while traveling through France’s Rhône Valley. He sought out growers who shared his passion for excellence and who dared to farm their vines to perilously low yields with the most advanced viticultural methods in the industry. This uncompromising winemaker’s lucid philosophy is summarized succinctly in three words: Passion – Evolution – Wisdom; the Passion of an unflagging love affair with Rhône varieties; the Evolution of winemaking techniques where even the most subtle nuance is divined from each new vintage; and the Wisdom gained with 20 years of winemaking experience. 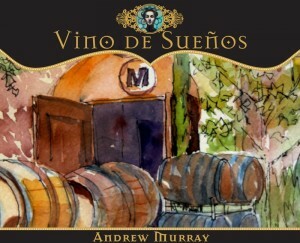 As Robert Parker, Jr. put it, “…Andrew Murray’s offerings are a breath of fresh air given their exceptionally high quality and realistic prices – reader take note.” We hope you’ll come visit us and delight in sampling the fruits of Andrew’s passionate labors.